The Workplace Hazardous Materials Information System (WHMIS) is changing. Since 1988, WHMIS has been Canada’s hazard communication system for workplace chemicals. It is a national system implemented through interlocking federal, provincial and territorial legislation and regulations. WHMIS is changing to adopt new international standards for classifying hazardous chemicals and providing information on labels and safety data sheets. These new international standards are part of the Globally Harmonized System for the Classification and Labelling of Chemicals (GHS) and are being phased in across Canada between February 2015 and December 2018. The GHS standards have been endorsed by the United Nations. They are also being implemented in many other countries including the United States, Australia, New Zealand, China, Japan and members of the European Union. The following WHMIS | Frequently Asked Questions (FAQS) and answers provide general information on the changes to WHMIS. For clarity, the old requirements are referred to as “WHMIS 1988” and the new requirements are referred to as “WHMIS 2015”. What is being done to incorporate the new standards into WHMIS? How will the transition from WHMIS 1988 to WHMIS 2015 take place? What is the Ministry of Labour’s approach to enforcement during the transition? During the transition, are workers required to be trained on both WHMIS 1988 and WHMIS 2015? What are the main differences between WHMIS 1988 and WHMIS 2015? How have stakeholders been consulted about implementation of WHMIS 2015? Will the process to claim an exemption from disclosing confidential business information (CBI) change as a result of the new WHMIS 2015 requirements? Do active claims for exemption need to be resubmitted as a result of implementing WHMIS 2015? Where can I learn more about WHMIS 2015? To adopt the GHS standards, federal, provincial and territorial governments must amend their WHMIS legislation and regulations. The federal government completed its changes on February 11, 2015, incorporating GHS standards into Canada’s Hazardous Products Act and new Hazardous Products Regulations. The federal amendments govern the classification, sale and importation of hazardous products by chemical suppliers (manufacturers, importers and distributors). Provinces and territories are at various stages of amending their WHMIS requirements to reflect the federal changes. Ontario has amended both the Occupational Health and Safety Act (OHSA) and the WHMIS Regulation to implement WHMIS 2015. The new requirements are in force as of July 1, 2016 and include a multi-year transition. Visit the WHMIS website for more information, by province and territory, on the status of implementing WHMIS 2015. How will the transition take place? The transition to WHMIS 2015 will take place in three phases. The first phase began on February 11, 2015 when the amended federal Hazardous Products Act and new Hazardous Products Regulations came into force. The final phase will end on December 1, 2018. During this period, WHMIS 1988 will be slowly phased out as outlined below. employers may receive and use hazardous products with either the old WHMIS labels and safety data sheets or the new ones. As of June 1, 2017, chemical manufacturers and importers must sell hazardous products with labels and safety data sheets that comply with the new WHMIS 2015 requirements. employers may continue to receive and use hazardous products with either the old WHMIS labels and safety data sheets or the new ones. As of June 1, 2018, distributors must sell hazardous products that comply with WHMIS 2015 requirements only. The transition to WHMIS 2015 will be complete for all suppliers. employers will have these final six months of the transition to bring their existing inventories of hazardous products into compliance with WHMIS 2015. By December 1, 2018, the transition to WHMIS 2015 must be complete for all parties. There should be no hazardous products in the workplace with old WHMIS labels and safety data sheets. Effective July 1, 2016, the Ministry of Labour will enforce the new provincial WHMIS 2015 requirements. It will also continue to enforce the WHMIS 1988 requirements for as long as they remain applicable to employers and workers (i.e. until December 1, 2018). With respect to the federal WHMIS requirements, the Ministry of Labour has enforced the new WHMIS requirements in the Hazardous Products Act (HPA) and new Hazardous Products Regulations since February 11, 2015. The ministry will also continue to enforce the old requirements in the former HPA and former Controlled Products Regulations for as long as they remain applicable to manufacturers and importers (i.e. until May 31, 2017) and distributors (until May 31, 2018). hazardous products with WHMIS 2015 labels and safety data sheets, as soon as practicable after these products enter the workplace and, in some cases, before they are used. The type and amount of training will depend on whether a product is new to the workplace and/or newly classified as a hazardous product. If the product is a controlled product under WHMIS 1988 and is already used in the workplace, workers should already be trained to work with it safely. If the same product enters the workplace with WHMIS 2015 labels and safety data sheets, and workers know how to work with it safely, workers may continue to use the product but must be trained as soon as practicable on the content and format of the new supplier labels and safety data sheets. If a hazardous product enters the workplace with WHMIS 2015 labels and safety data sheets, and it was not previously used at the workplace, the product may be stored but not used until workers are trained on the new supplier labels and safety data sheets as well as procedures for the safe use, storage, handling and disposal of the product, including in an emergency. The same applies if a product is a hazardous product under the new system but was not classified as a controlled product under the old system. A generic worker training course is available for a small fee online from the Canadian Centre for Occupational Health and Safety (CCOHS). The key responsibilities of suppliers, employers and workers are the same under WHMIS 2015. WHMIS has remained largely unchanged since it was established in 1988. It is a comprehensive system for communicating information about hazardous workplace chemicals. However, there are health and safety benefits to adopting the new GHS standards. WHMIS 2015 addresses some hazardous properties of chemicals that are not addressed in WHMIS 1988 (e.g. specific target organ toxicity – single exposure and aspiration hazard). WHMIS 2015 provides for standardized language on labels and safety data sheets, ensuring employers and workers receive the same core information about a product, regardless of supplier, and enhancing their ability to understand it. 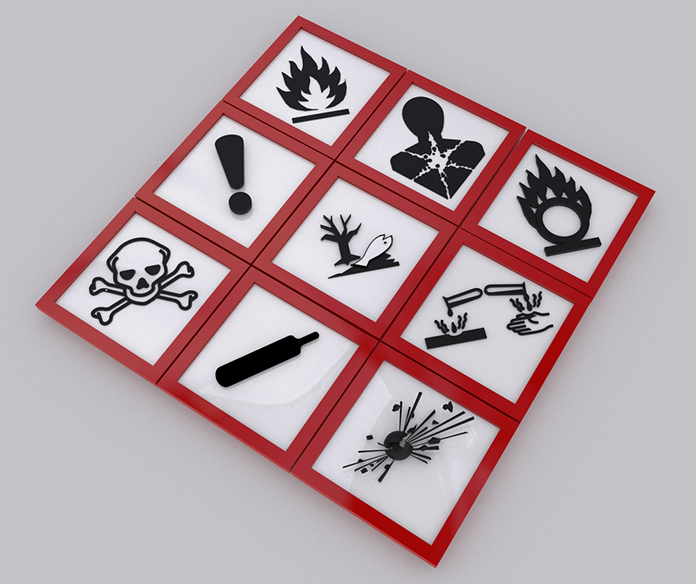 Some of the new pictograms are considered to be more easily understood than the old WHMIS symbols. This will improve hazard communication, particularly to workers who have difficulty reading. Adopting GHS standards for hazardous workplace chemicals will also facilitate international trade in chemicals and enhance the competitiveness of Canadian suppliers. Both the federal and Ontario governments have consulted stakeholders on the changes to WHMIS legislation. Health Canada, through a multi-stakeholder committee, has engaged representatives of suppliers, employers and workers in the process to amend WHMIS legislation and implement GHS standards. This has been done for a number of years through annual meetings and regular teleconferences. Health Canada publicly consulted on proposed regulatory changes from June to September 2013, and on draft Hazardous Products Regulations in August and September 2014. Amendments to the Hazardous Products Act were introduced in March 2014 as part of the federal government’s Budget Implementation Act (Bill C-31). They were consulted on publicly at that time, before being passed in June 2014. The Ontario Ministry of Labour held public consultations on proposed amendments to the province’s OHSA and WHMIS Regulation in November and December 2014. This was done through a posting on Ontario’s Regulatory Registry. There are no substantive changes to the process to claim an exemption from disclosing confidential business information (CBI). For a period of time, suppliers and employers claiming exemptions under the federal Hazardous Materials Information Review Act (HMIRA) may file claims for safety data sheets and/or labels that comply with either WHMIS 1988 or WHMIS 2015 requirements. The claimant will have to indicate this information on the application form. as of December 2017, Health Canada will only accept employer claims under the HMIRA with WHMIS 2015 safety data sheets and labels. Active claims do not need to be resubmitted. Product labels and safety data sheets must, however, comply with the Hazardous Products Act and associated regulations. If a decision has been issued for a claim prior to the coming-into-force of WHMIS 2015, there is no requirement to submit a WHMIS 2015 safety data sheet or label prior to the expiry of the claim unless specifically requested to do so. More information is available at Confidential Business Information – Transition to WHMIS 2015. More information about the new federal WHMIS requirements is available at WHMIS.gc.ca. General information for suppliers, employers and workers is available at Canada’s National WHMIS Portal. If you require WHMIS training for your company, please visit Safety First Training for assistance.